Cast: Maggie Smith, Kristin Scott Thomas, Patrick Swayze, Rowan Atkinson, Tamsin Egerton, Liz Smith, Emilia Fox. Story: A vicar and his family find a new housekeeper. Keeping Mum is a deliciously dark British comedy about murder and adultery in the sleepy village of Little Wallop. A peculiar combination, but a very effective one. It's the cast that's the key to Keeping Mum. 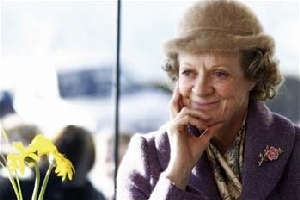 Maggie Smith is always brilliant and this is one of her finer moments, both charming and eccentric with a dangerous bent. Kristin Scott Thomas is superb as Rowan Atkinson's stressed wife, while Atkinson himself underplays his country vicar for a change, adding a huge dollop of warmth to an already cosy recipe. Emilia Fox simply melts the screen as she is wont to do in her unfortunately slender opening role - she has the kind of deep, impossibly beautiful eyes that can make a man crumble under their spell. Patrick Swayze is the odd one out inasmuch as he could have ruined things, but he doesn't - he's outclassed in this company but doesn't disgrace himself. As the story develops, the characters grow with it and there are some truly touching moments in the final reel to round off the genial comedy nicely. In all, it's a well-rounded and complete affair with much to praise. Keeping Mum is a nice, rich story that translates into a thoroughly enjoyable screen experience. It's fairly slow but will engage all but the bolshiest of viewers with its effortless charm and good nature. Highly recommended. Testosterone Satisfaction Rating: 2/5 - we get a couple of flashes of Tamsin Egerton's boobular area and there's rather more effing that you might expect from a village community. To enjoy this film you should be: an Anglophile. Keeping Mum is on general release in the UK now.